Please call the library for more information at 715-623-3724. Library cards are issued free to all WI residents. No fee will be charged for changes of name, address, and phone numbers. To receive a card, an applicant must furnish one piece of identification with their current address. Acceptable identification includes a driver’s license, state ID, current military ID, or a passport. If the acceptable identification does not have a current address on it, a bill, paystub or rent certificate with the current address and a dated within the last month will be sufficient as proof of address, along with the ID. If a current address is unavailable there will be a circulation limit of 2 items at one time. Minors, defined as 16 years or younger, must have their Library Card application signed by a parent or legal guardian. Minors who have a WI ID or driver’s license may get a card without parent or legal guardian signature. 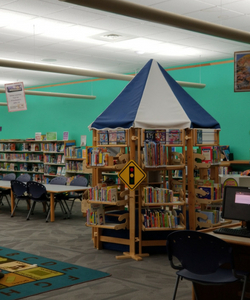 Upon parent/guardian request the library will disclose library records of their child’s use of library resources. This reflects library patron privacy as stated in WI statute 43.30. 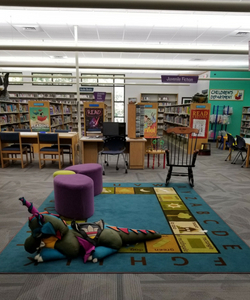 Parents or legal guardians who wish to limit items that their minor children (under 18, as stated in WI state Statute 990.01(20)) check out need to speak to library staff to have appropriate message placed on that minor’s card. Library staff will do their best to honor the parent’s or legal guardian’s wishes as long as it does not cause undo hardship on library staff or degrade library service for other library patrons. 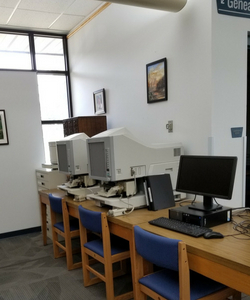 The library will look up obituaries from local papers to the best of our abilities with the information provided to us. When sending in an obituary request please send as much information as possible such as death date, date or date range the obituary appeared in the paper if possible, full name and or nickname of person or persons obituary you are requesting. You can also do this on your own using our microfilm machines and computers. Call 715-623-3724 to set up an appointment with Maria P. or Elizabeth S.